Create Custom Surveys & Polls! Create polls and surveys which allow your site visitors to voice their opinion. This means they become engaged and you start earning more profit! You can change the style for each poll / survey with header, footer and content. You control how the polls look and appear in each post and/or page. Since you can control the appearance with a time delay, it only makes sense to alert your visitor. Choose one of the built-in alerts if desired. Add video, styles and even footers. Simple enough for 12 year old. Create unlimited polls & surveys. Plays nice with themes & plugins. Coded with the latest techniques. Excellent for social network sharing. DISCOVER WHAT YOUR VISITORS REALLY THINK! You can easily redirect visitors to any page desired after they complete your surveys. Place surveys into posts, pages and even into sidebars with complete freedom. You can add an option "attention grabber" audio on survey load and when closed. Ability to setup surveys so only available to members and registered users. You get full snapshot of survey data so it is easy to see what works best. With all of the in-depth customization features you can layout as desired. 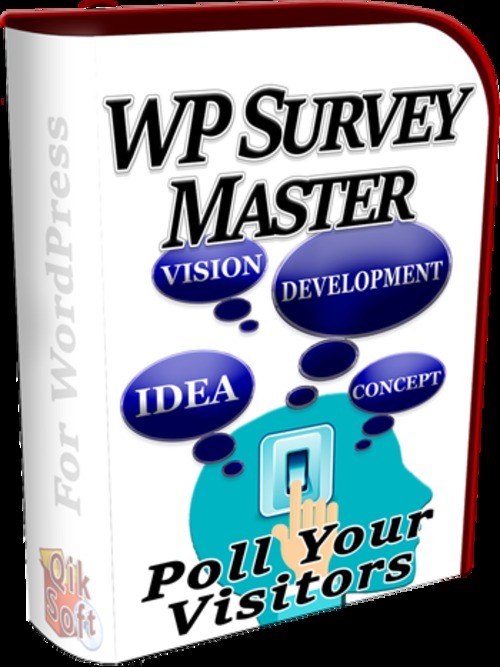 WP Survey Master is a very simple plugin to use. It installs just like any other plugin and is not a "resource hog". You will be creating polls and survey that gives you profit pulling insight into your visitors mind. If you will allow your visitors (or members) to give their input on content or your products, many will give you valuable information. You can take the data and tweak your content which will result in a much better experience for them. It has been said throughout history that "information is power". In todays competitive world, Webmasters and content creators need all the help they can get. Using this plugin will help you make profitable decisions. How To Turn Wordpress Into A Full Cms System + 2 Bonuses!